Secret to Success System found at secrettosuccess.co has made a bold guarantee to cover all your trading losses. Is it too good to be true? More importantly, is Secret to Success System a scam? Let’s find out the shocking revelation in our Secret to Success review. Is Secret to Success System really paying for your losing trades? The alleged owner of Secret to Success System, Timothy Galvaki claims that he has secured a deal with a broker to guarantee your profits, as long as you sign up through his sales page. So how does it work? Timothy Galvaki is actually offering you an automated binary trading software, which he calls the Secret to Success App that trades binary options on your behalf when you sign up for this particular broker. He claims that as long as you leave a positive review for this broker, your losses will be covered for your lifetime, which means you are guaranteed to make profit every single time. Sounds too good to be true? Indeed. This is nothing but a blatant lie Timothy tells you to make you sign up for his system, and then makes money off you. Secret to Success System is a scam. Gaelle claims that he has not made any losses since he joined Secret to Success System because all his losses have been covered! His trading account never dipped and he’s making a great deal of money every single day with Secret to Success App provided. This is the true identity of Gaelle, and of course his real name is not Gaelle. 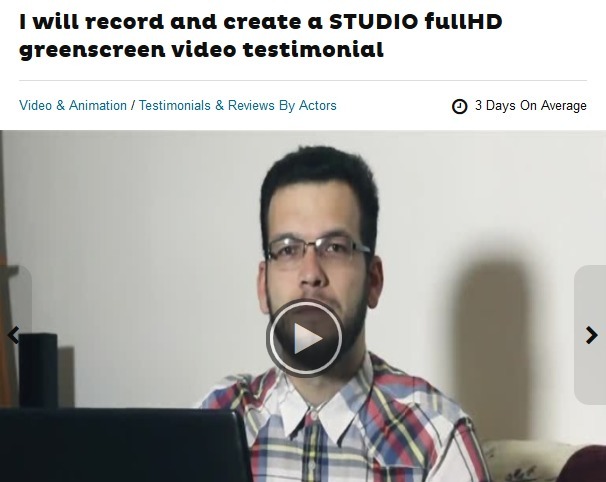 He’s one of the many actors and actress found on Fiverr.com that read any script given by their clients like a real testimonial for as low as $5. The raving reviews you see in Secret to Success are all fake testimonials. There are more conclusive proofs to show that Secret to Success is a scam, and we’ll reveal it at the later part of this review, as well as guiding you to the real way to make money online. Since this is a binary trading scam, we need to briefly talk about how binary trading works to make sure everyone is on the same page. If you have experience trading binary options, feel free to skip ahead to the next section. Binary trading is basically trading stripped down to its simplest form. Unlike traditional instruments like stocks and Forex markets where you need to analyze charts and financial news, binary options is simplified to choosing between “Yes” or “No”. You only guess if the price of an asset will rise or fall after a short period of time, usually between 30 seconds to minutes. Here’s how it works – let’s say I think that the price of gold market will fall after 60 seconds, and I bet $50 on a 1-minute contract. When the time is up, and the price is indeed lower, I win a certain percentage of what I bet, usually between 60% to 80% ($30 to $40). But if I’m wrong, I lose the entire $50 that I have invested. Binary trading is actually not that different from gambling. There’s no way to predict the market movement in such a short period of time, and get it right consistently. Can you guess the outcome of a coin toss with confidence? The odds is almost at 50-50. The same principle works on binary options. Even if you manage a 50% win rate, you’ll still lose money due to the uneven winning vs losing payout of binary options. This is why majority of binary traders lose money, and the difference in payout is how brokers make big money off them. In the entire sales materials of Secret of Success System, never has once did Timothy mention about the possibility of losing money with his system and his recommended broker. However, if you find the risk disclaimer linked through a fine print at the very bottom of his sales page, you’ll find out the hidden truth. Of course, the disclaimer is so well hidden that not many users will click into it at all. Secret to Success allows its users to trade in highly speculative investments which involve a significant risk of loss. Secret to Success explicitly does not make any express or implied warranties or guarantees that user will make any profit or that user will not lose any or all deposited investment funds. Secret to Success System admits that trading binary options is highly risky, and there’s a high probability that you’ll lose money. 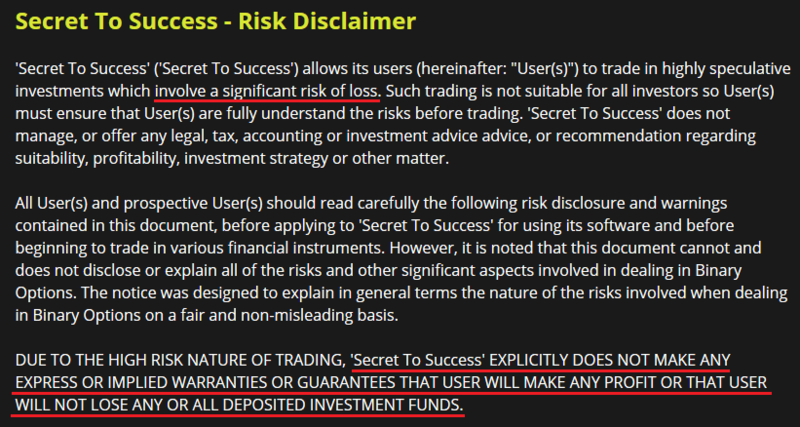 Despite giving you multiple guarantees that you will not make a single loss using Secret to Success System, Timothy is going back on his words by denying any guarantee that his users will not lose thier investment funds. Fact #2 alone should be enough to steer you clear of this blatant scam. These terms are not included as a fair warning for you. The sole purpose is to protect the scammers from legal actions when you lose all your money using their Secret to Success System. If you decide to sign up with Timothy’s Secret to Success System, you’ll have to register for a broker account through his sales page (which is an affiliate link). Timothy and the scammers will earn a sum of referral fees as soon as you make your first deposit. I was assigned to Binary Book, an affiliated broker with Secret Millionaires Club. The minimum deposit with Binary Book is $250. You may be assigned to different brokers depending on your country and location. The minimum deposit for most of these brokers is the standard $250. Even if you already have an existing account for your assigned broker, you will need to register for a brand new account using a different email address. This is because the scammers behind Secret to Success System cannot earn their referral fees if you do not sign up through their affiliate link. Is Secret to Success System a Scam? YES, SECRET TO SUCCESS SYSTEM IS A SCAM. As we’ve said in the review earlier, we don’t recommend binary options trading as a way to make money online, at all. It’s not that different from gambling, and using an automated trading software is no different. You are essentially putting your hopes and entire investment in a piece of software that gambles on your behalf.